There's no doubt about it, SharePoint is a complex creature. 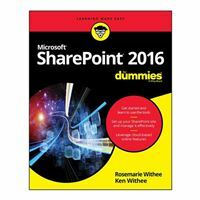 But when broken down into easily digestible chunks, it's not quite the beast it appears to be right out of the gatethat's where SharePoint 2016 For Dummies comes in! Written in plain English and free of intimidating jargon, this friendly, accessible guide starts out by showing you just what SharePoint 2016 is, translating the terminology, and explaining the tools. Then it helps you create a site, work with apps, and master basic SharePoint administration. Next, you'll learn to use SharePoint 2016 to get social, go mobile, manage content, and connect with others through working with Office 365, archiving documents, developing workflows, and so much more.